Always Get the Name of the Dog is a guide to journalistic interviewing, written by a journalist, for journalists. It features advice from some of the best writers and reporters in the business, and takes a comprehensive view of media interviewing across multiple platforms, while emphasizing active learning to give readers actionable steps to become great media interviewers. Through real scenarios and examples, this text takes future journalists through the steps of the interview, from research to source identification to question development and beyond. Whether you are a journalism student or an experienced reporter looking to sharpen your skills, this text can help make sure you get all you need from every interview you conduct. "Learning how to interview effectively is one of the most important skills a young reporter must develop. 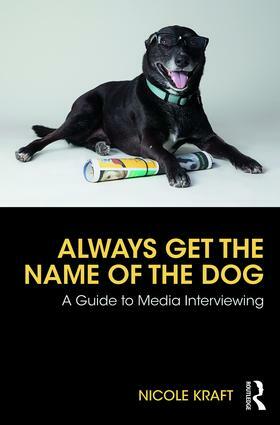 With Nicole Kraft’s Always Get the Name of the Dog: A Guide to Media Interviewing students and new journalists will learn both the basics of the interview and strategies to insure that every interview results in revealing quotes and illustrative anecdotes. Filled with lessons from her career as a reporter, this text also offers excellent tips on quickly developing rapport with interview subjects and turning interviews into conversations. Other aspects of interviewing—including the importance of preparation and how listening can be as important as asking questions—are also emphasized, making Always Get the Name of the Dog one of the best teaching tools on the interviewing process that I’ve read." "I’ve been interviewed by thousands of news reporters, including Nicole Kraft. More recently, she and I have taught media courses together. No one understands the practical, legal and ethical issues facing reporters better than Professor Kraft. This book is a must read for anyone working in journalism." –Mark R. Weaver, Media Law Attorney, Communications Counsel, Inc.
"Nicole Kraft is one of the finest professors in the world. Always Get the Name of the Dog is essential reading whether you’re navigating the rigors of j-school, starting your career or an established veteran." Nicole Kraft Ed.D. is a professor of journalism at The Ohio State University, and has been a professional journalist and writer for decades.